What's the fun of just one choice? 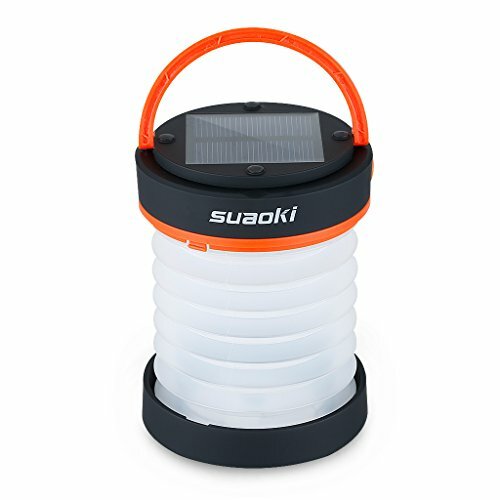 The lantern¡¯s built-in 800 mAh battery can be charged via three individual solar panels or fully charged in just 4 hours through a Micro USB cable. Plus, an additional USB output lets you plug in your smartphone, tablet, or other gadgets and top off their batteries, meaning you can charge worry free even while you're out-there adventuring. The last thing you need is another gadget slowing you down. Our product weights just 190g and can be collapsed to half of its length into a convenient to carry puck-like shape. The shape and the hard-plastic outer case act as a shell and protect the unit during transport, so you can throw it into or onto your backpack or carry and not have to worry about extra weight or damage to the unit itself. 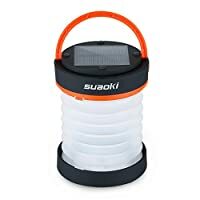 Thanks to its convenient design and light modes, Suaoki¡¯s lantern can also be used as a high powered flashlight when it is compressed, perfect for situations where you need a concentrated source of light during camping, hiking, trekking, adventuring, or any other activity. Plus, the low mode lets you use the lantern as a reading or area light when you need a dimmer light source, and the flashing mode makes it great during emergencies.